If you love living in a quaint community with pristine weather, then you will find a piece of your heart lives in Culver, Oregon. 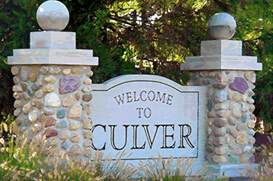 Culver is a small farming city that is 2,633 feet above sea level. They grow such crops as garlic, potatoes, alfalfa, grain and mint to name a few. One of the best things about this city is the weather. In Culver you will be blessed with a beautiful summer, spring, winter and fall, as the weather is always just right. In the summer the weather never reaches over 100 degrees. Snow may sprinkle the city in the winter, but the weather does not go below the twenties. It is a small community; a family community, and though small, still big on fun. Depending on your interest there is much to do and see in Culver, Oregon. If you like sitting by the lake and contemplating life, then you may want to check out Lake Billy Chinook. You will also enjoy this lake if you are into boating, fishing, hiking, or a camper, as this lake actually attracts half a million people a year. There is also the Culver Crawdad Festival, which is held every year and filled with tons of a fun. You may also want to check out the Haystack Reservoir, which is where a boat race is held annually. There are a few lovely parks in the area, and there are options for shopping near by, such as, Culver Market or The Store. Thinking Of Moving To Culver? Buying a home in Culver, Oregon is actually quite affordable. The median home here cost approximately 290,000. A few popular neighborhoods you may want to check out are: 3 rivers rec, Culver Heights, and Culver Ridge. The homes in Culver have a modern feel to them with greenery and trees all around. Most properties sit on plenty of land leaving you tons of options, which are open to your imagination. The homes here are spacious leaving you room to move and breath. Schools in the Culver tend to be the talk of town. The parents are happy; the students are happy and this gets around. The elementary school is called Culver Elementary and this school has received five stars from the parents. Parents are saying that the staff is great and they have never seen their kids so excited about school. Having a low student to teacher ratio probably helps too. The middle school here is Culver Middle School and this school not only encourages the best from your children, but offers your kids plenty of extra curricular activities. They have such sports as wrestling, football, and track to name a few. Culver High School prides itself on their commitment for community and parental support. They offer extracurricular activities that include Future Business leaders of America club, and such sports as, softball and baseball. One parent raved about how happy they were with this school. They said that the parents really care about the children and it is evident in how happy the children are. It seems like Culver, Oregon is a pretty cool. It offers wholesome food, a wholesome life and wholesome fun.